Birthday is a special day for the person for whom the day is. It is a memorable day for everyone. Someone tries to maintain it gorgeously where someone just remember the day. However, day by day it is going to be popular in among us. If you are far away from the person, you can just send a birthday SMS to wish the person. To make your birthday wish best for your nearest person, We've arranged top 21 Bangla Birthday SMS or Bangla Jonmodin SMS. By these SMS you can say anyone as Shuvo Jonmodin or Happy Birthday wish. You can use these SMS to send to someone via your mobile or smartphone. To use these Bangla SMS, just copy an SMS and go to your message apps and then create a new message or SMS, then paste there and send to your desired person's number. These 21 Bangla birthday SMS have been selected according to their quality and usefulness. 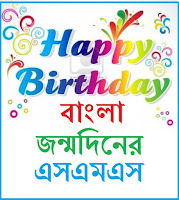 We've tried to have best wishes for birthday in your Bangla birthday SMS. You can read these Bangla birthday SMS online or you can download these Bangla SMS in PDF format. 3. Aj 2mar jonmodin,jibon hok tomar ronggin, .sukh jeno na hoy bilin, dukkho jeno na ase konodin, "HAPPY BIRTH DAY"
4. Shuuo Shuvo Shuvo Din Aj Tomar Jonmodin. Mukhe Tomar Dipto Hashi Ful Futache Rashi Rashi. Hajar Fuler Majhe Golap Jemon Hashe Temon Kore Bondhu Tomar Jibon Jeno Sukher Sagore Vase. "S"H"T"V"O "J"O"N"M"O"D"I"N"
6. Aj 2mar jonmodin,,, Ki dibo bolo upohar?? Jonmodine 2mar hridoy dilam uphar. 7. Aj ker Ei Rat-Tomar jonno Deke Anuk Shukmoy Notun 1k provat,AJker Ei din-Tomar jonno hok Kostohin,ajker Ei Somoy-Ta sudu Tomar jono arTo karo Noy..janay Shuvo jonmo din- Tomar jonno Aj prithibita hoyia jak Rongin..happy birthday 2 u..
8. Ovimaner meg vasiye daw Onek dure,Mon karaper dinta tumar na asuk fire,Dukkho gulo daw uriye oi akaser nire,Osim sukh boye asuk 2mar Jibon Jure. *""Happy Birthday To U.""*..! 9. Bidhatar Sukher Nire Hok 2mar Bosobas. Sopno Gulo Sotti Hoye Kete Jak 12 Mas. Icche Gulo Dana Meluk Projapotir Moto.Muche Jak 2mar Jibone Dukkho Ache Joto. Happy Birthday. 10. Rup kothar Rani tumi, 2 noyoner Alo, Sara jibon emoni kore veshe Jabo valo. tumi amar jibon moron,Amar cholar sathi. tomak chere 1la ami ki kore thaki.?? "Happy Birth day janu"
11. Flying papers , multi colours of balloon, delicated blossom, fantastic people, love and laughter. What it describes? HAPPY BIRTHDAY. 13. Jonmodiner shubechcha, priti R bhalobasha, Pouchhobe tomar kache, amar ei asha. Ei kobita pore tumi hasbe hoyto, ke ba jane Udyeshya sophal hobe, jodi ei sms ekta hasi tomar mukhe aane ! Shubho Jonmodin ! 14. Misti alor jhikimiki sobuj ghase ghase, Snighdho haway duliye matha fuler koli hase, Pakhir gane poribese mayabi ek dhoya, Peyeche ora Tomar Subho Janmadiner chhoya ! Happy Birthday ! 15. Kaaro Saturday priyo din Kaaro Sunday Amar sudhu priyo ekta din Tomar Birthday ! Happy Birthday ! 16. Janmodiner shubechcha, priti R bhalobasa, Pouchhobe tomar kache, amar ei asha. Ei kobita pore tumi hasbe hoyto, ke ba jane Udyeshya saphal hobe, jadi ei sms ekta hasi tomar mukhe aane ! Shubho Janmadin ! 19. Ekta katha balar chhilo .. Kee kore boli.. Bolchilam je.. Ami tomake bolte chai… Happy Birthday ! 21. Aar ekta bochor ese gelo, Bere jabe R ekta mombati, Kal o chilam aaj o achi Tomar janmadiner sathi ! Happy Birthday! To download the collection of 21 Best Bangla Birthday SMS, you are requested to click here! By the way, we are at the end of our 21 Best Bangla Happy Birthday SMS Collection to read online or download SMS PDF. In this point, from Bangla Books PDF, we are happy to see that you've just read the SMS collection presented here. If you like these Bangla SMS collection, then be kind to share it with your friends on Facebook, Google Plus or Twitter.